The Panzer VIII Maus is the heaviest tank ever built. It was manufactured in Germany by Porsche towards the end of the Second World War. 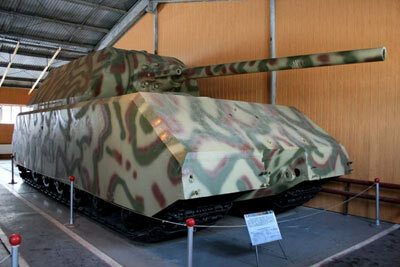 And only one completed tank was produced before it and another partially built example were captured by the Soviets. 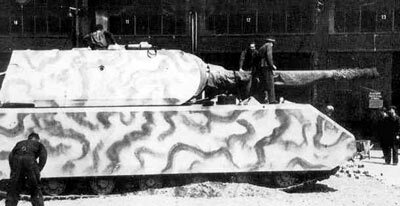 The Panzer VIII Maus was massive. It's 188 ton weight dwarfs that of other super-heavy tanks, like the American T28 (95 tons), and the later Soviet tank dubbed Object 279 (60 tons). The Panzer VIII Maus was 33ft 6in (10.2 m) long, 12 ft 2in (3.71 m) wide and just under 12 ft (3.64 m) high. Its main armament was a colossal 128 mm KwK 44 L/55 gun which could destroy any tank of the Allied forces, even at ranges in excess of 3,500 metres (2.2 miles). The same gun was used in a casemate design in the series production Jagdtiger tank destroyer. 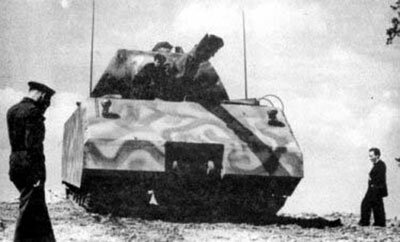 The VIII Maus' secondary armament was a coaxial 75mm gun, while a smaller 7.92 mm MG 34 machine gun provided was mounted on top. The tank's size, while being its most impressive feature, was also its greatest weakness. Development of a suitably powerful drivetrain proved problematic, eventually engineers settled on a hybrid internal combustion/electric setup which provided 1,200 horsepower. It's top speed was a mere 12 mph. In addition to its low top speed, the tank's weight meant it wouldn't be able to cross most bridges. Instead it was designed to ford rivers up to 2 meters deep, or with the help of a snorkel, submerge up to 8 meters and make the crossing. EDIT: The above image actually shows a Russian Medium tank, the T-34-85, instead of a Tiger. 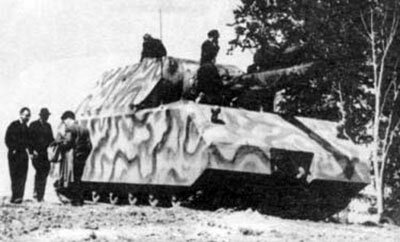 Befitting its size, the Panzer VIII Maus was extremely well armored. The front features 8.7 inches (220 mm) of steel protection, while the turret armor was even thicker at 9.4 inches (240 mm). Even the sides and the rear were encased in 7.5 inches (190 mm) of steel. The tank was designed to punch holes in the enemy's defensive line, while being able to withstand a barage of fire and take out Allied armor even at long range. 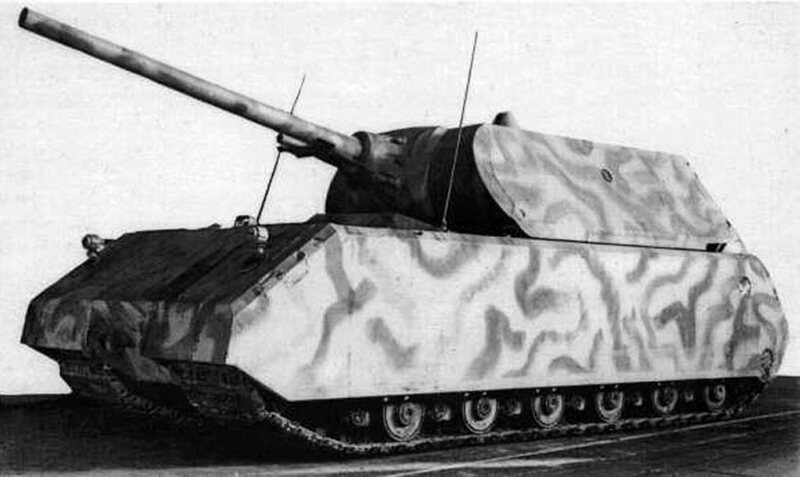 Five tanks were intially ordered, although only two were ever built, and one of those was never fitted with a turret. 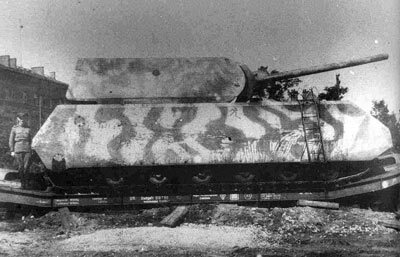 When it became clear that the advancing Soviets would soon capture the facility where the VIII Maus was being tested, the Germans attempted to destroy both prototypes. 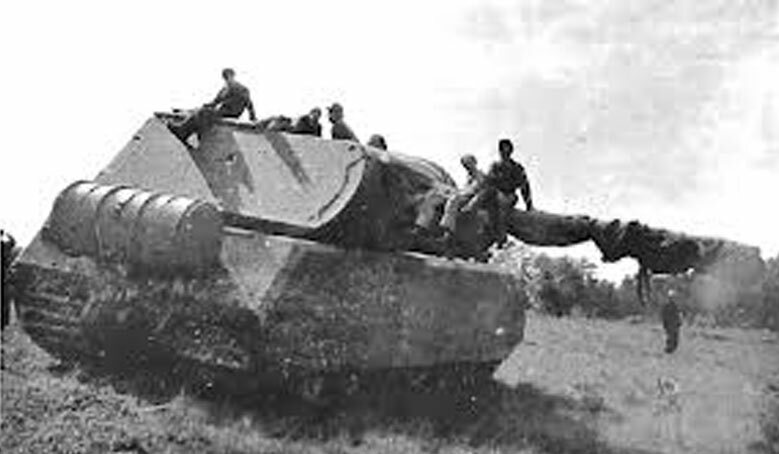 They partially succeeded, however the Soviets were able to mix and match the two partially destroyed prototypes to create a single working tank which was taken back to Russia. It currently resides in the Kubinka Tank Museum near Moscow.